Guangxi is one of China's Autonomous region located in South Central China, renowned for its spectacular landscapes, charming natural scenery, and ethnic customs, there is no other place like it which makes it a destination not to be missed. I am definitely adding Guangxi into my wishlist, this will be the place to experience the true ethnic and cultural diversity of China. A total of close to 200 people were present at the promotional event, these includes Hu Jing Bo, the Deputy Director of the Tourism Commission, along with the Malaysian Ministry of Tourism, tourism agencies, industrial representatives, and visitors. 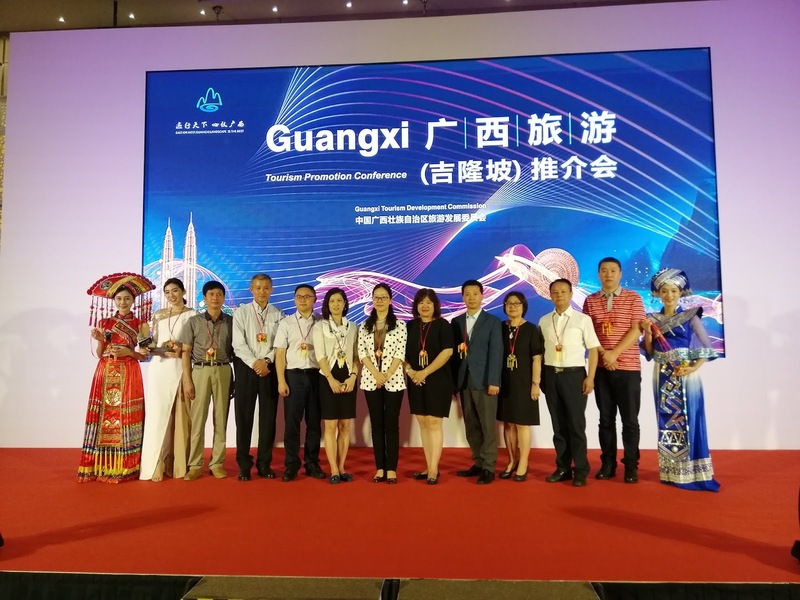 It is believed that this activity could build an even tighter bond between the Malaysian and Guangxi China tourism industries, and create potential exchange of resources in the future. The Guangxi Autonomous Region Tourism Development Commission has organized an event to promote Guangxi tourism activities. Themed “East Or West Guangxi Landscape Is The Best”, Malaysians visitors were able to perceive the charms of the “Beautiful Scenery in Guangxi” via 6 fascinating short films titled “Lao, Shao, Bian, Shan, Hai, Shou”"
During the event, Guangxi's culture, arts, and food were shown, the beauty of folk customs, mysterious ancient cultures as well as the appeal of a hometown of longevity were also an attraction for their visitors. Traditional folk music and dances were also performed on stage. The whole event was livened up through mobile live broadcasts, interactive activities and attractive prizes. Liu Bao Tea has a long history of more than 1500 years. The tea originates from LiuBao town in Guangxi, this tea has the function of relieving summer heat and helps in digestion. Rohan Fruit is no strangers to Malaysians but I did not know it is from China, it comes from Guilin in Guangxi, this fruit has high nutritional values to it which is why it is known as the fairy fruit. This fruit helps to relieve cough and expectorant and it is also suitable for diabetic people. One special product from Beihai, Qingzhou, and Fangchenggang is the sea duck eggs. How are these eggs special? The ducks are raised on the beach by the fishermen, therefore the ducks eat small fishes and shrimps resulting these eggs to be rich in vitamins and proteins. All these unique and distinctive customs and cultures contribute to making a tour of Guangxi very enjoyable to visitors which is why Guangxi is a travel destination you should consider for your next trip.